Teacher Collin Shadwell shares a joke with student artists who created this year's colorful district banner for the Kentucky School Boards Association conference. Fort Thomas Independent Schools District banner shows a whole education includes academic and nonacademic experiences. Art teacher Collin Shadwell introduced the students at the March school board meeting. He explained that schools across the state are invited to submit a banner representing their district at the KSBA to be displayed throughout the conference. "These guys were an easy choice," said Shadwell. "What I like about Tyler and Aiden, whenever I give them a project, I don’t have to do anything else. My job is done. They just do the rest on their own....They would stop by after school and add a little more each time until the whole thing was finished. 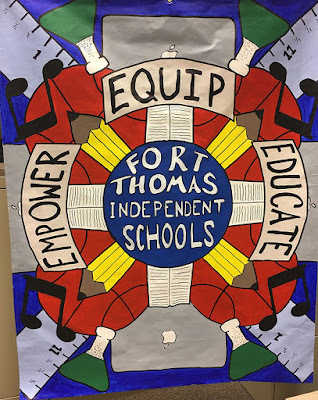 They have represented Fort Thomas schools with amazing work." 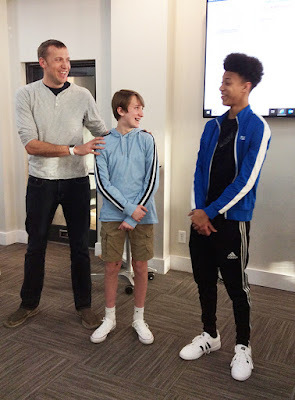 School Board member Karen Allen told the students, "I like that you incorporated science and music and sports – you incorporate everything that goes into making an education. Not just the studies but more of the experience as well." Both students said they plan to take art in high school next year.